Hezbollah leader Sayyed Hassan Nasrallah said in a speech yesterday that it was only “natural” for the Trump administration to include Iran’s Islamic Revolutionary Guard Corps (IRGC) on its terror list, as the IRGC is the ‘most powerful and influential force’ in the Middle East today, one that supports and backs the “resistance factions and movement” in “every battlefield”. 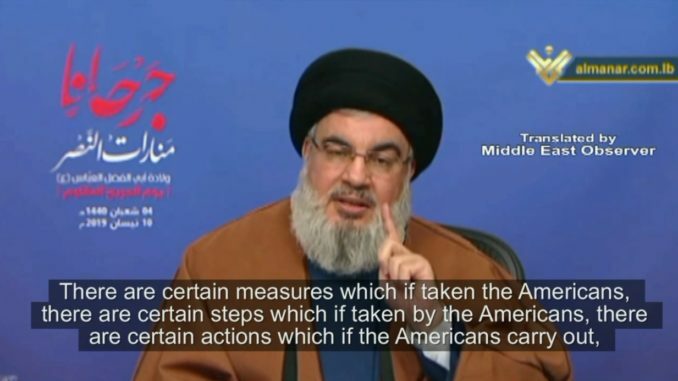 Nasrallah also warned the US that if its measures against the “Resistance Axis” escalate to certain dangerous levels, then ‘powerful cards’ which the “Axis” enjoys will definitely be used in response. What is occurring then is something natural – I consider it to be natural, and we must view it as such. Okay in the recent past they placed the resistance movements and factions (on their terror list), today they took an unprecedented step and placed the (IRGC) on the list, because the (IRGC) occupies a central position, whether in terms of the support (it provides), the influence (it exerts) – we must admit and describe the reality as it is. The Islamic Revolutionary Guard (Corps) in Iran occupies the central and foremost position in terms of the regional equations, it is the strongest, the most important, it is the most influential, and it is linked to all these (battle)fields, and it provides to (all these fields) support and backing. So eventually, after the Americans placed us all – the resistance factions and movements – on the terror list, they will reach the central and main faction or force, that is the Islamic Revolutionary Guard (Corps). This reflects the disappointment of Trump and the Americans, (after) the hundreds of thousands (of militants) that they brought to the region, and the tens of thousands of tonnes of weapons and ammunition, and the hundreds of billions of dollars that were spent, yet the result was: failure, defeat and disappointment. This is the first point that needs to be clear for us. The second point, it is the message of today, if there is something I wanted to say today, it is this stance and message: O’ brothers and sisters, I say this to you and to the Americans, and to all those who are betting on (such) American measures, because it appears that (their ‘terror’) list will grow, and the issue will go on: terror lists, sanctions, and there is also intimidation in Lebanon even towards some of our friends and allies, even though till now it appears to be only intimidation. I will come back to this at the end with the section on Lebanon. What I wish to say today: it is true, today when we are before terror lists and sanctions, we suffice ourselves – until now – with condemnations, disapproval, and denunciations, patience, fastening our belts, and with administering the situation. However, this does not mean that we do not have important and crucial cards of power. Here I do not speak only about Hezbollah, I speak about the whole Resistance Axis. The Resistance Axis, with its states, regimes, armies, peoples, and resistance movements and factions. (Let’s say) the ‘Resistance path’ – if someone wants to use the Axis description it may be more narrow – we hold many cards of power, and many elements of power, however till now we have not carried out a reaction, we are still acting with the consideration that what the Americans are doing is in response to their disappointment and defeat, and so they are resorting to such measures to confront and weaken us, and to (try to) limit the (magnitude) of our victories, achievements and advancement. However, what I wish to say today, on this great and blessed day, is that this is not a permanent policy. There are certain measures which if taken the Americans, there are certain steps which if taken by the Americans, there are certain actions which if the Americans carry out, who says that they will be (carried out) without a reaction, and without an answer, without strong answers? (Responses to be carried out) from the cards of power held by the resistance fighters and the Resistance Axis in this region. Who assumes this? I tell them not to assume this. You (would be) mistaken. When any resistance faction or movement, or any part of the Resistance Axis feels, or when we (ourselves) feel, that there is a certain dangerous situation that threatens us, our people, our nation, and our major causes, who says that we will suffice ourselves with condemnations and denunciations? It is our natural right (to do so), because we are here in the position of defence. It is our natural right, rather, it is our moral, religious, and humanitarian obligation to confront all those who may threaten with their measures our peoples, people, country, or resistance, or threaten the achievements and victories (produced by) the blood of our martyrs, our injured ones, those who have been imprisoned, our families, and our mujahideen and resistance fighters. However, naturally our hand is open, and our options are open, yet with complete calmness and cool mindedness and at the appropriate time, and when a (particular) measure requires a response, then there will certainly and undoubtedly be an appropriate response. We are at your service O’ Nasrallah! My words encompass all the scenes and battlefields which America thinks that it can violate. The issue is not like this. And the battlefield is not empty. And I wish to stress on this point – (although) I do not need to do stress on the credibility of what I am saying. This is our history, our past, our present, our reality, our resistance, our victories, our perseverance, our sacrifices, and our stances, all of this confirms this stance.